Obituaries can be rich in genealogical details. 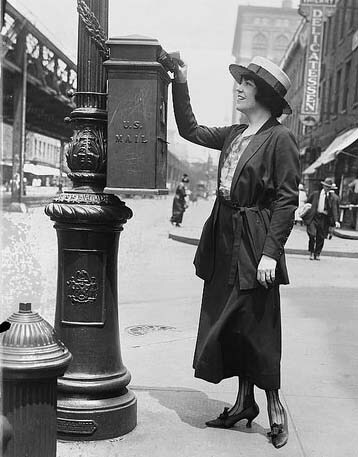 However, finding them for our female ancestors can be tricky, especially if you're searching in digitized newspapers. 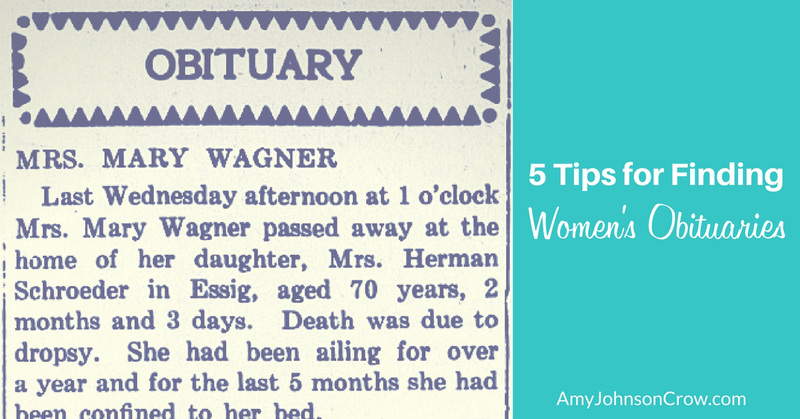 Here are 5 tips to help you find women's obituaries. Dresden Enterprise and Sharon Tribune (Dresden, Tennessee), May 07, 1920, Chronicling America. Kinsley (Kansas) Graphic, October 02, 1896, Chronicling America. 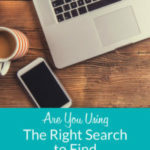 Do a search either for the full name of one of her surviving children or sibling or search for her last name and the married surname of one of her daughters or sisters. 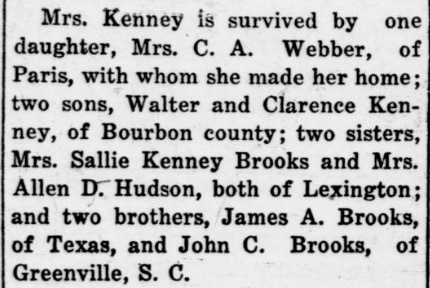 Look at all of the names in part of the obituary for Mrs. Jennie Brooks Kenney. Bourbon News. (Paris, Kentucky), January 17, 1922. Chronicling America. 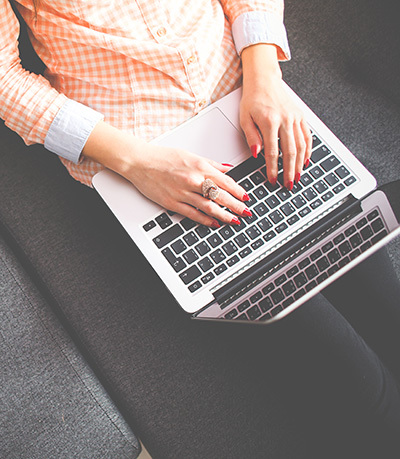 Females, especially girls and young women, are sometimes listed with a nickname or diminutive form of their first name. If you're not finding Catherine, try searching for Kate or Katie. McCook (Nebraska), Tribune, June 03, 1892. Chronicling America. There are so many combinations of how her first name could be listed. Try searching for her last name plus the name of the cemetery. If you know Nancy Hopkins was buried in Bethel Cemetery, try searching for Hopkins Bethel. Don't overlook the newspapers in places where she used to live. It isn't unusual for newspapers to print obituaries for people who used to live in the community, especially if they still have a group of family and friends in the area. Skip the search; read the paper. If you have access to the newspaper where she lived, read it. Yes, searching can be faster. However, OCR (optical character recognition) technology is not 100% accurate. If the print is fuzzy, there's a wrinkle in the paper, or they used an oddball font, it might not be "read" correctly by the computer. The obituary could be in the paper, but it was lost in translation. 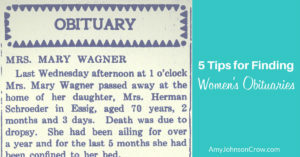 What tips do you have for finding obituaries for the females in your family tree? 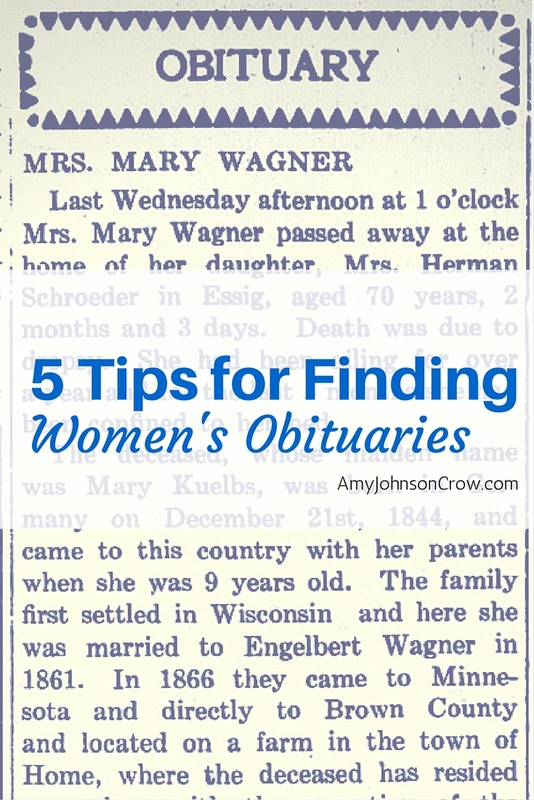 This entry was posted in tips and tricks and tagged females, newspapers, obituaries, women by Amy Johnson Crow. Bookmark the permalink. Great tips! I usually try to search within the newspaper of the town they lived, if I can, and just use their last names. 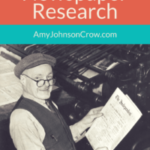 Local Funeral homes may “publish” obituaries when, because of the cost, the family does not pay for an obituary to be inserted into a newspaper. All great tips that definitely work. I also found (for anyone in the household) that using the street name (especially because it was unusual and our family name is not) was another great way to search. I started searching that way after I noticed a lot of the articles I was finding would say Mrs. Arthur Matthews of Nafus Street. I’ve also seen this, but never thought to search that way. 1) Don’t get too hung up on places. –a cousin from central PA died in central NY while escorting a daughter to college. The death site seemed really unlikely, but it was so important to *read* the NY newspaper account. –a spouse of a central-PA cousin died in Florida, where the newspaper death notice named her but not surrounding circumstances. Her estate record in PA confirmed this was the same person who died in FL, but I still don’t know why she was there. –a cousin died in an automobile accident far from home. 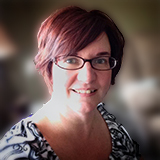 –a central-PA cousin died in a Massachusetts house fire; she was working in MA at the time. 2) Searching for all known family members may yield results. One of my cousins was called only the mother of Charles so-and-so in a death notice, which does not name her at all. I recommend women adding their maiden names onto headstones. Wouldn’t it be great if every married woman had that?! It would help solve so many questions. Or if women simply kept their birth names! I was surprised when I took a good look at my grandmother’s headstone & it read, Margaret Rahm, wife of Claude Quick. I thought that rare since she died in 1941. My great grandmother’s maiden name is on her headstone, along with her initials but not her given names, of which there were three. Way too long for the headstone. Hi Amy. 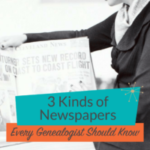 I included a link to this great article in the latest edition of UpdatesGenie (http://updatesgenie.blogspot.com/2016/03/no40-genealogy-news-and-discounts.html). During certain periods of time, addresses were always published for the deceased. If you know the address, search on that. Otherwise–use all of the above. 🙂 Names of children, siblings, etc., etc. 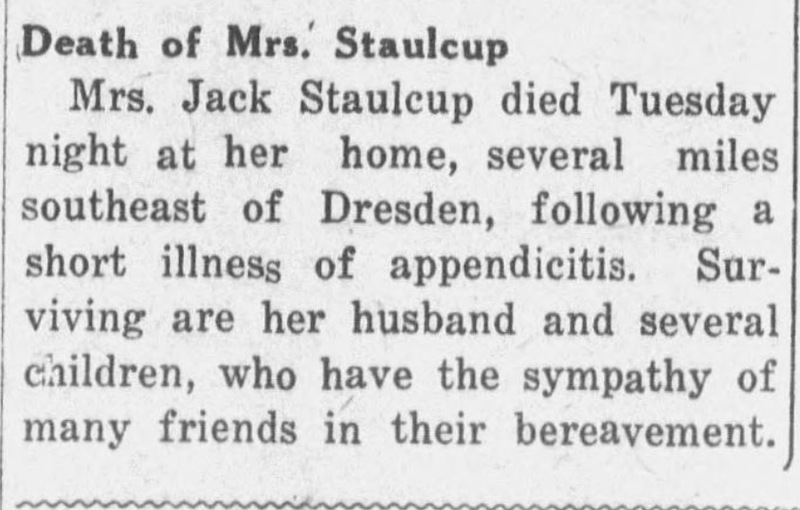 And I found the obit for a 4th great-grandmother in a NYC paper when she died in Indiana in 1821.